What were they thinking about? 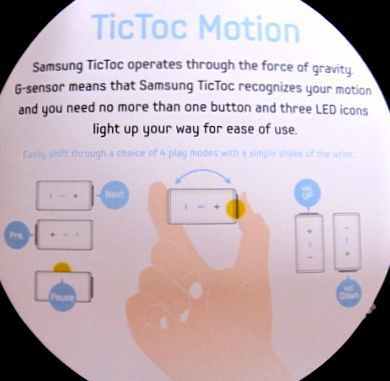 What can possibly have got into the Samsung engineers’ minds, let alone the marketing guys, to make them think that the Tic Toc was a good idea? 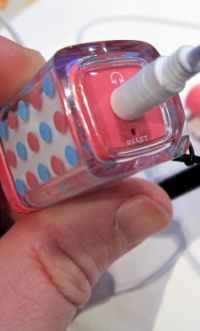 Announced at CES, the Tic Toc is an incredibly small MP3 player which has but one button. You control it by turning this way or that, or shaking it quickly or slowly. As the power says: “Easily shift through a choice of four play modes with a simple shake of the wrist”…”through the force of gravity”. We could make an MP3 player much smaller if it did not have to have buttons or a screen on it (a bit like saying a car could be much more efficient if only it did not have to carry passengers). I know, we play the Wii by shaking the controller, we could do the same with our MP3 player. Meanwhile in the marketing department… “an MP3 player with no buttons, no one has ever done that before, we’ve got to show it at CES”. But wait! How do most people use an MP3 player? That’s right; on the move. You just plug in your ‘phones, bit play, stuff it in your pocket, and go jogging, cleaning the house, dancing, bounce on the trampoline, do some gymnastics, and enjoy your music uninterrupted. Or not, because the Samsung Tic Toc (and I bet they have a patent for it) will probably have had an apoplectic fit by then. Guys, just because you can see that something is possible, does not mean you should go and do it. This entry was posted in imagine and tagged fun, go to market, product, specification. Bookmark the permalink. I think that this is a cute and original object that plays music. I find conformed plastic and no display makes it particularly tough for sporty and/or young users. This object is not for the users that want to see what they are listening, or who like to play games or browse websites or send emails, or watch movies in a huge (but fragile) screen. this object is for the users that could buy iPod shuffle for listening to music in a more casual way, that want to save some money and have something light and endurant. If it is cheap enough it can be a VERY good product to buy. The question is “are you the user for this product?”. Fair enough, if the questions over usability are resolved and the price is really low, then yes, an iPod Shuffle competitor. That’s great, so glad that my scepticism proved to be unfounded for you.